Posted on February 9, 2017 by Michelle M.
Cooper decided that once a month she wants to feature those who rescue, shelter or are active in the conservation of her feathered friends. This month she would like to promote Phoenix Landing. 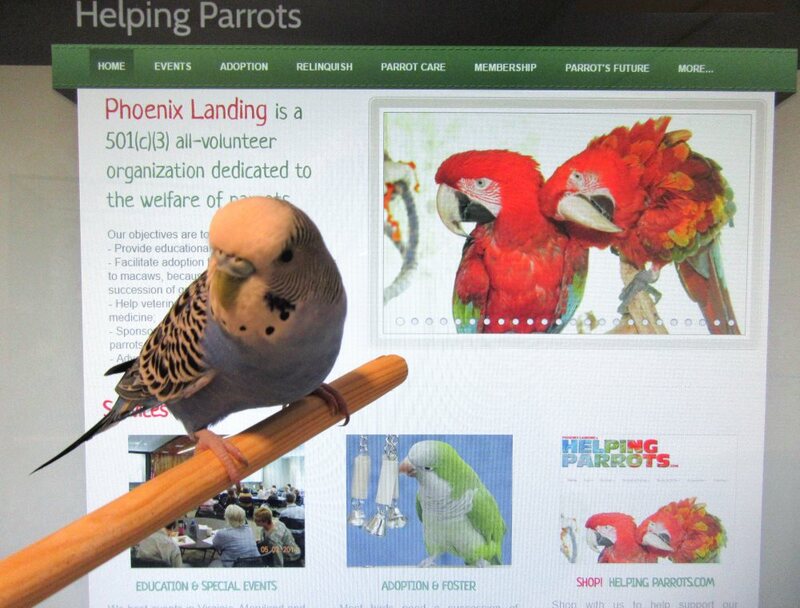 Phoenix Landing is an all volunteer organization dedicated to the welfare of parrots – from budgies to macaws.They facilitate adoption, have a foster program, help veterinarian students interested in avian medicine, sponsor research and conservation for wild parrots, advocate standards of care for birds and provide educational opportunities for the public. Phoenix Landing has helped 2,663 parrots ​as of February 1st. A newsletter is available on their site if you would like to know more. You can donate on their site. They also have a store with toys, perches, clothing, books and food for birds. Shopping here helps to support their education and adoption programs. Thanks to Eve for letting us know about this wonderful organization. This entry was posted in Feathered Friends and tagged bird rescue, budgie, Cooper, Feathered Friends, parakeet, Phoenix Landing by Michelle M.. Bookmark the permalink.